Neuromuscular electric stimulation for shoulder pain has been established over the past few decades to be an effective therapy used by physical therapists to treat shoulder muscles. However, there are some complexities in the therapy because of the large muscles that surround the shoulder joint and the relationships between these muscles. The shoulder joint is one of the most complex joints in the entire human body. There are articular surfaces between the three bones and there is movement on and around three different planes. 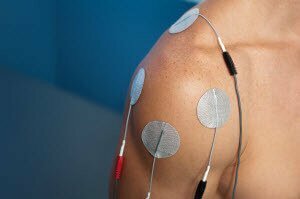 Despite these complications, there are electrical stimulation programs that are effective for shoulder therapy. Electrical stimulation may be used at different levels to treat patients who are suffering with frozen shoulder and shoulder-hand syndrome. As previously stated, electrical stimulation is limited in the muscles around the muscle joint and difficulties trying to restore the synchronization of the shoulder muscles. This is why these types of treatments are typically limited to the initial treatment phase. Unfortunately, electric stimulation for shoulder pain is not as effective as other treatments when the range goes over 90 degrees on a horizontal plane. Electrical stimulation is typically limited to no more than two muscle groups. This is why shoulder flexion, or greater than 90 degree horizontal plane abduction is very difficult to achieve. Electrical stimulation of the deltoid muscle is usually not enough to produce abduction over 90 degrees. However, dual channel stimulation activates both the middle and the anterior muscles to give the muscles enough strength to achieve a range of motion that is above the horizontal plane. The dual channel stimulation can cause discomfort in some patients. This type of electrical stimulation is usually limited to orthopedic patients who need muscle strengthening in the posterior area of the deltoid muscle. It can also be used with certain patients with spinal cord injuries. Neuromuscular electric stimulation for shoulder pain can be a very effective way to mobilize the shoulder early, especially if the patient is experiencing a lot of pain. Because of the complexities of the method, it is not advised for patients that are looking for terminal range of motion degrees. The therapy can, however, be an alternative to assistive devices such as slings. Are you considering electric stimulation for your shoulder pain? Contact us to schedule an appointment today.